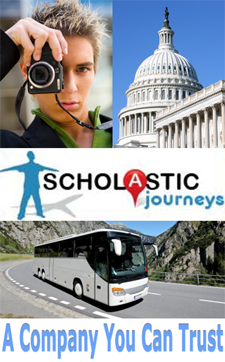 Scholastic Journeys is located in Arlington, VA, across the Potomac River from our Nation’s Capital. We are experts planning and operating student bus trips to Washington, D.C., Colonial Williamsburg, Philadelphia, New York City, Atlanta, Orlando, and other top destinations along the East Coast and throughout The United States, Canada, and Europe. Scholastic Journeys is a leading educational student group travel and receptive services operator, serving as a reliable host to the nation's schools, scouting programs, and youth organizations requiring pre-planned or customized services. Whether you are traveling by motorcoach (bus), air, or rail, Scholastic Journeys is there for you. Large youth groups with multiple buses are welcome. If you have a special request, give us a call 1-877-724-6064. Our experienced professional staff will help make your students' travel dreams come true. Scholastic Journeys strongly adheres to stringent certifications and industry membership guidelines. We carry a comprehensive travel insurance package that adheres to all mandated and suggested protocol. Our student travel professionals stay up-to-date with industry research, and our knowledge can insure a once-in-a-lifetime experience targeted to the specific needs of your group. For the best educational and fun activities appealing to students and youth groups start planning your next trip with the most sought-after professionals in the travel business: Scholastic Journeys. Contact us for your schools' next trip.